href=”http://code.google.com/android/” rel=”homepage” target=”_blank” title=”Android”>Android, and basically all major mobile OS platforms, don’t use a visible windowing system Like href=”http://www.apple.com/macosx/” rel=”homepage” target=”_blank” title=”Mac OS X”>OSX, href=”http://www.kernel.org/” rel=”homepage” target=”_blank” title=”Linux”>Linux and, uh, href=”http://www.microsoft.com/WINDOWS” rel=”homepage” target=”_blank” title=”Windows”>Windows. Most of the time that’s because there just isn’t enough space on a smartphone or tablet screen for more than one application at a time. Wind River, a branch on Intel, has found a way around that restriction, and may make true user window management on Android a reality soon. 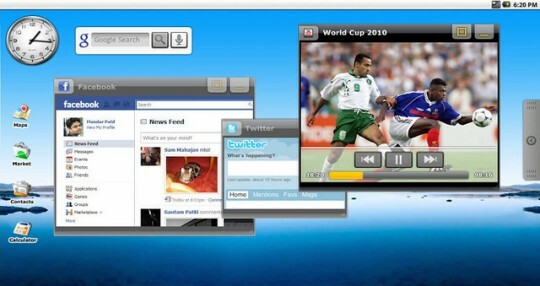 The company has developed a user interface modification that allows multiple apps to be shown on the screen simultaneously, in a manner not dissimilar to desktop operating systems. In fact it’s even got the minimize and maximize buttons that’s become a staple of desktop UI design. Obviously there isn’t much utility for smartphones, even with the incredible resolutions we’re getting as of late – the physical space of the screen just wouldn’t support this kind of multitasking. But tablets are another matter, especially considering that 1920×1200 and even higher resolution screens are rumored for the near future. Wind River is developing the UI software to sell to manufacturers, in the hopes that they’ll incorporate it into their own customized versions of Android. The demonstration above looks like it’s running on a Cupcake or Donut build, so it’s obviously a long way from making it to modern Honeycomb or Ice Cream Sandwich machines. Still, I wouldn’t mind giving it a try, especially since there’s still no way to run videos in the background on Android.